It was 1988 when John Broaders, or Big John as he’s affectionately referred to, left Ireland to start looking for a new life. Large unemployment had hit the country, leading John, and approximately 45,000 others to leave their native Ireland. John drove over to England with his cousin, her boyfriend, and brother with ‘nowhere to live and no jobs lined up’. What was Ireland’s loss was England’s gain, however, as their social system welcomed new workers. In less than a month, John and his travel companions had jobs and accommodation, even if it wasn’t the most glamourous. 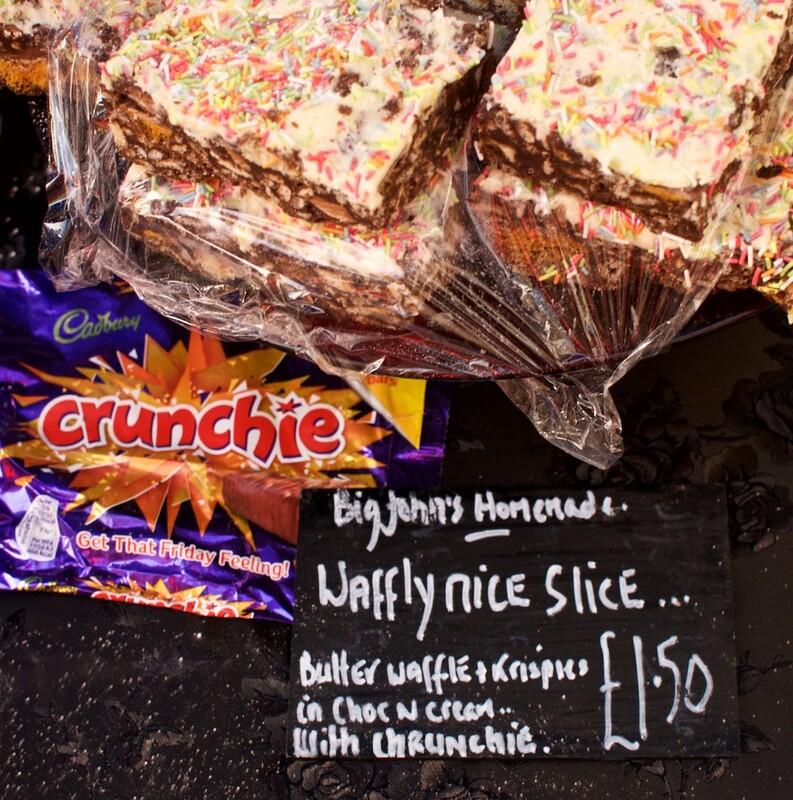 Brief stints working in newsagents, supermarkets, and the local council led John to an Area House Manager role for 15 years, situated just a stone’s throw away from Whitecross St. where he pitches his cake stall every Thursday and Friday today. So how did Big John make the transition to selling cakes from a seemingly unrelated background? It began in 2005 when Masterchef was on the lookout for new contestants. John was eager for a new challenge, “I didn’t tell anybody, I kept it to myself and I just applied. I was by no means a chef, but I was always a good cook, and I wanted to test my abilities. I didn’t want to win it, I wouldn’t cope, but I just wanted to challenge myself”. Successful in the preliminary rounds, John was shocked when Masterchef called. “I nearly died when they rang and said I got through to the TV shows, I asked myself, what have I gotten myself into?”. John made it to the quarterfinals for his efforts, happy and proud of how far he had come. The following year, John was invited again to compete and, with more confidence and understanding, he admirably reached the quarterfinals once again. John’s television appearance had got him noticed by EC1 Enterprise, a quango organization wanting to regenerate Whitecross Market. The century-old market had declined over the last decade, due to the drop in demand for traditional market items like clothes. EC1 asked John if he’d be interested in opening a street food stall, “I wasn’t sure but it sounded fantastic”. After the initial failure of trying to imitate the famous Borough Market, Whitecross St stripped down to a smaller street food scene, and success followed. “All the arty farty was gone, and anybody who survived and stayed, got their prices and image right, they absolutely flourished for the last 10 years and most of them are still here”. However, all good things must come to an end as EC1 lost government funding meaning financial backing to promote Whitecross St dried up along with it. With no money to support the market, the street, once voted the third hippest in Britain, had hit its peak and now gone down hill. It’s a pity that in the current climate where street food is booming they are unable to capitalize on it by promoting the market and engaging the local community more. John explains, “without promotions, people don’t know the markets is here. I overheard two girls on the bus yesterday, one said to the other, “there’s a fabulous food market down there” and the other said, “I've never heard of it”, and they both got off at the stop, she never knew there was a market there”. Nevertheless, the forever struggles of working in the street food industry have brought happiness in John’s life, “I don’t do this to make a living, you’ve seen my prices. Having a stall got me out of a bad place and it made me happy. I absolutely love it, I'm Chairman of our little Trader's Association which gives me a sense of purpose. It’s fun and I have the freedom to support the people that have to do it for a living so I try to keep everything cohesive and altogether”. Keeping ‘everything cohesive and altogether’ is something John worked on to make the market a friendly environment where everyone could profit. “Before the traders association, the restaurant owners fought with the market. So my primary role at that time was to stop the fighting and work together. I made the option of the shops having a stall. They then realized, wow, we’re all making a lot of money and they started working with us”. The divided mentality of ‘us’ against ‘them’ was replaced with ‘unity’. John’s view and ultimately his success as the Chairman has been his ability to not be frightened by competition but to welcome it, “I relish it because when Pret-A-Manger and Waitrose came it brought more people into the area. If it brings more people, then people will wander up and look at our stuff and say this is a lot better”. Nestled on the edge of the Shoreditch area, more shops are opening around Whitecross St, having a positive effect on the area gaining more office workers, tourists and locals to come down to their historical market. As long as Big John continues to be a voice for his fellow vendor's, rest assured the market will work together to make the most of the current street food bubble, selling Jazz’s curry, Gerry’s chocolates or by Big John’s Cakes. 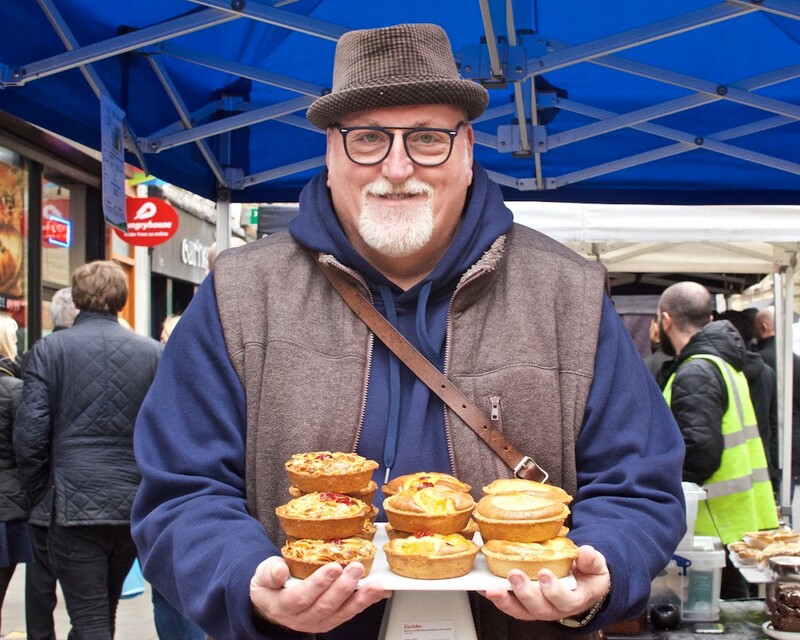 Find Big John most Thursdays and Fridays at Whitecross St Market selling ridiculously large cakes and simultaneously ensuring everyone queues up correctly to not block the street while his friend Gerry lends a helping hand. Check out the Streats app to discover more incredible street food in London. Kang We Do It? - Yes We Kang!